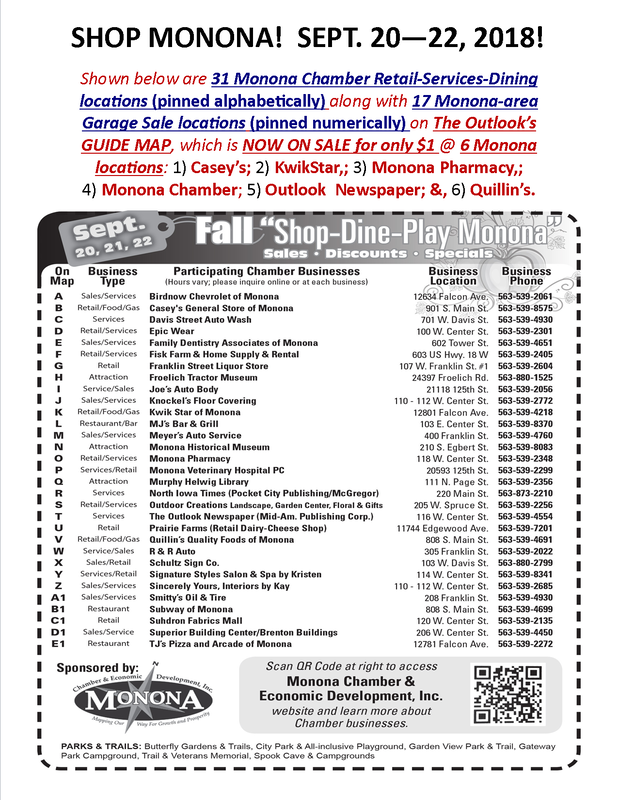 9/20/18 - 9/23/18: SHOP-DINE-PLAY MONONA - Monona Chamber & Economic Development, Inc. Grab your friends & family! Have fun shopping at our fine array of retail, gift, and specialty shops & also at the same time at Monona's city-wide garage sales. All are sure to satisfy your needs!! Monona has 4 beautiful connecting parks & trails, 2 museums, $1M library expansion, veterans memorial, all-inclusive handicapped-accessible playground & much more for you to relax, picnic, recreate & enjoy on beautiful autumn days. Take a break during the day to relax at your favorite spot for a tasty bite to eat & drink . . . pamper yourself at a full-service salon . . . or get gas or groceries while your car is serviced . . . then end with a refreshing cold drink a local dining establishment. Thurs. - Sat. + some extra Sun. 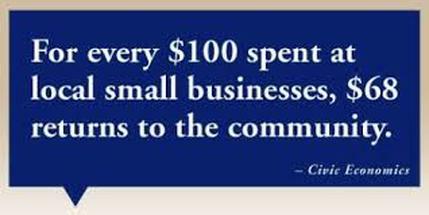 sales & specials by 31 Monona Chamber businesses. Our entire MFL-area community is served this fall by 17 garage sale sites in all 3 towns! sales - specials - discounts! 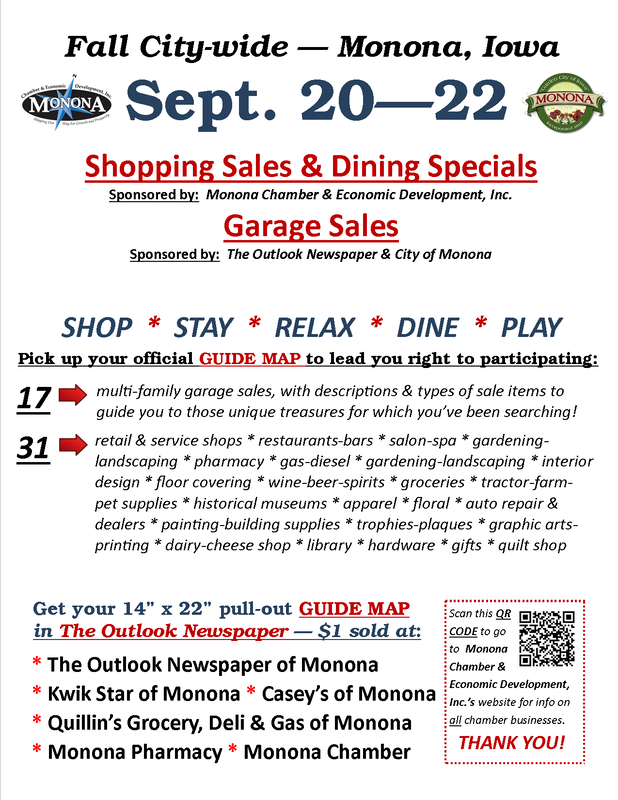 See The Outlook newspaper's full-page pull-out map insert pinpointing Monona Chamber merchants' 31 retail-services & dining locations + 17 city-wide garage sale locations. 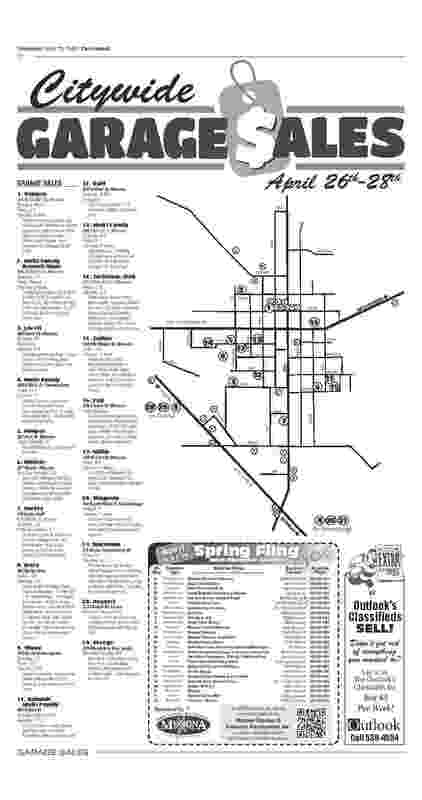 ​SAMPLE BELOW OF SPRING, 2018 GUIDE MAP OF GARAGE SALES & CHAMBER SHOPPING-DINING SITES. ​Get your official Fall, 2018 "GUIDE MAP" for $1 @ 6 in-town locations -- OR -- simply look inside your own copy of The Outlook Newspaper. 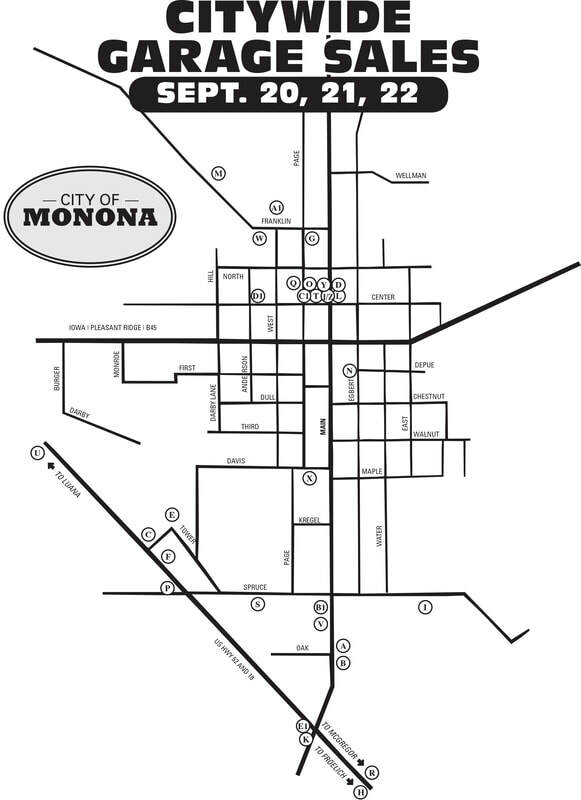 Check out Monona Chamber's "MEMBERS" section on its website to find a particular store, service, or item; an eatery or bar; and, park, trail, library, or museum to enjoy in your shopping & garage sale-going! 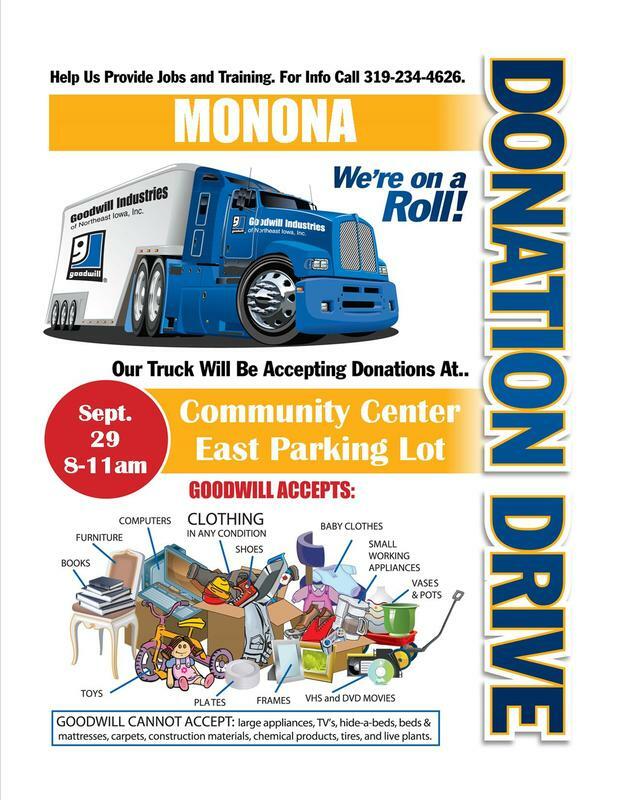 ​NOTE: ​What is not sold in a garage sale may be donated to Good Will via the manned truck on Saturday, September 29 from 8 - 11 AM in Monona Community Center's east (gravel) parking lot -- thanks to our local Inner-Faith Church Council volunteers.